Evo 2013 is over, which means it's time for another top five moments video from Maximilian. Head inside to see if your favorite moment made the list. 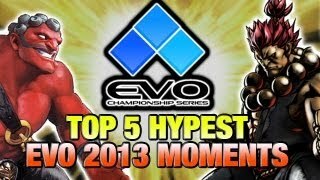 Maximilian is sticking with tradition by releasing his top five Evo 2013 hype moments. The list ranges from Reynald's King of Fighters XIII run to Justin Wong's dramatic comebacks in Ultimate Marvel vs. Capcom 3. Click here for the top eight Evo 2013 results.